A more rapid method than Western blot analysis to detect a specific protein in a cell, tissue, organ, or body fluid is enzyme-linked immunosorbent assay, or ELISA. This method, which does not require fractionation of the sample by gel electrophoresisis, is based on the property of proteins to readily bind to a plastic surface. To detect viral proteins in serum or clinical samples, a capture antibody, directed against the protein, is linked to a solid support such as a plastic 96 well microtiter plate, or a bead. The clinical specimen is added, and if viral antigens are present, they will be captured by the bound antibody. 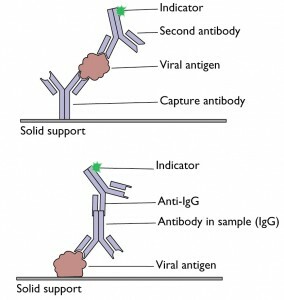 The bound viral antigen is then detected by using a second antibody linked to an enzyme. A chromogenic molecule – one that is converted by the enzyme to an easily detectible product – is then added. The enzyme amplifies the signal because a single catalytic enzyme molecule can generate many product molecules. To detect antibodies to viruses, viral protein is linked to the plastic support, and then the clinical specimen is added. If antibodies against the virus are present in the specimen, they will bind to the immobilized antigen. 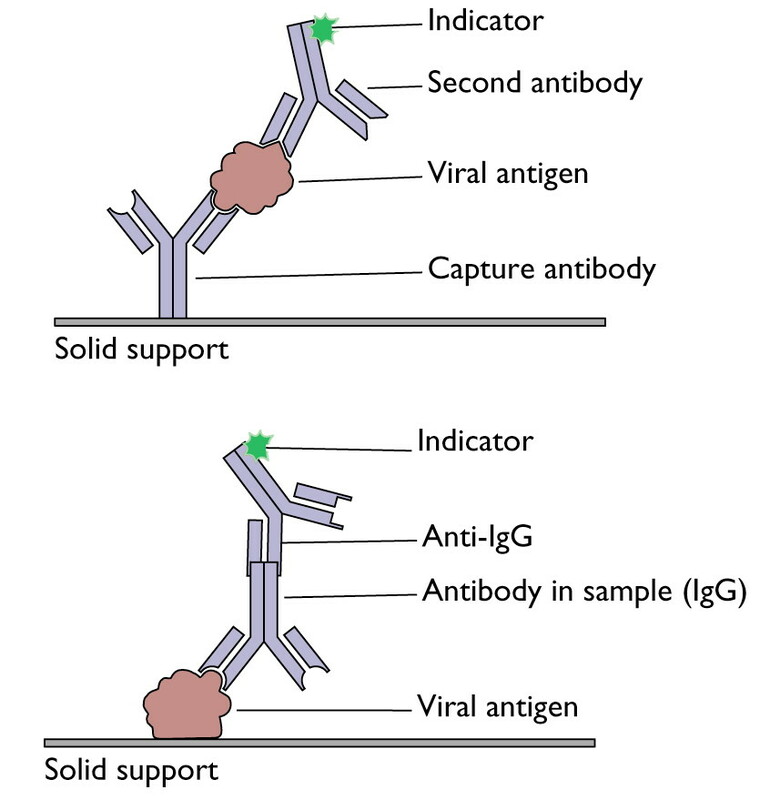 The bound antibodies are then detected by using a second antibody that binds to the first antibody. ELISA is used in both experimental and diagnostic virology. It is a highly sensitive assay that can detect proteins at the picomolar to nanomolar range (10-12 to 10-9 moles per liter). It is the mainstay for the diagnosis of infections by many different viruses, including HIV-1, HTLV-1, adenovirus, and cytomegalovirus. Thank u so much. It’ll b a great help when explaining ELISA 2 juniors. what is the unit of the “titer” here??? Is it the IU of the enzyme that converts the substrate? I have a positive ANA done by Athena Beads through Labcorp that test 9 different antigens. If any antigen is counted over 100 it’s a positive. I also had the Direct Elisa and it came back negative. Which is more accurate? Or does the Athena Bead Ana check for an antigen that the Elisa didn’t? I’m confused. I do have Hashimoto’s and suffer low grade fevers and fautige daily. Lupus runs in the family. Should I retest and if so… what type of ANA test is the most accurate?